Golf industry expert Jon Last doesn’t subscribe to the frequently heard opinion of other analysts that as far as the golf business is concerned, “the sky is falling, the sky is falling.” The well-known president of Sports & Leisure Marketing based in White Plains, New York in fact has a positive view of the future. 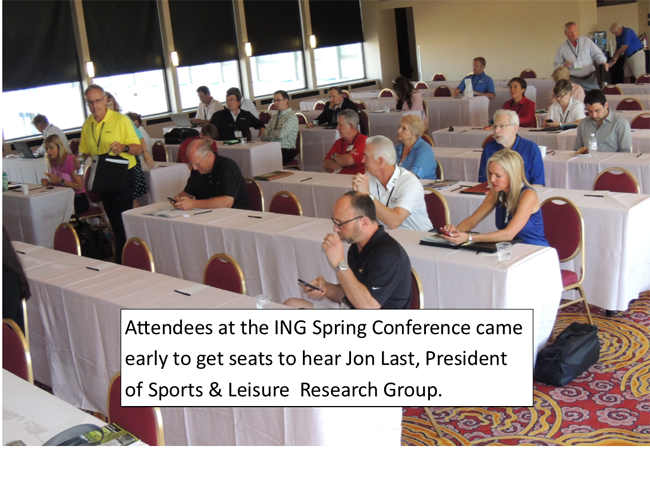 After listening to his presentation its clear Last firmly believes “the sky is not falling” and in the slow-to-no-growth environment for the past several years there are opportunities for companies and golf facilitates to take marketshare away from competitors. Last cites the statistics the number of golfers grew from 24.2 million in 1990 to 25.7 million in 2011 or 6.4 percent even taking into account what he called the “Tiger Bubble” in the early 2000s from people attracted to the game due by the prominence of Tiger Woods. The most recent data shows the number of participants to have stayed roughly the same even considering an estimated loss of 400,000 players in 2013. The exact number of golfers though is unknown but participation presently, according to informed estimates, is somewhere from 24.1 million to 28.7 million. For everyone from driving ranges to high end courses to equipment manufacturers the business challenge while the growth rate is at best marginally positive is to find what needs to be done to market themselves more effectively. That is, both to differentiate themselves in the marketplace plus making customers into enthusiastic advocates, especially new customers presently buying other brands or playing at other courses. Stressing how company’s treat customers as the key, Last reviewed ways to make the experience of be ing a customer more enjoyable and providing perceived value. As an example he identified programs some private clubs are using to give members added value by creating strong emotional ties. 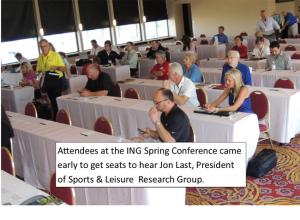 While he sees customer orientated changes taking place more often at private clubs that doesn’t mean the same ideas can’t be translated and used at public facilities where 80 percent of golfers play. And since women are the largest potential source of new business, making them feel welcome and connected to the facility through such things as group lessons and leagues is an important factor. 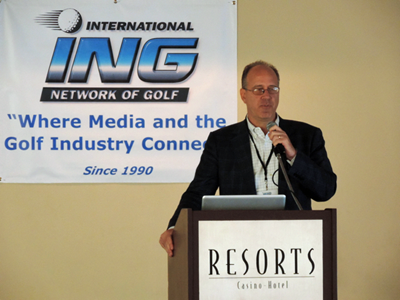 The main point of Last’s presentation at ING was the golf business in addition to acknowledging the factors that contribute to the problems golf is experiencing the industry has to “embrace family­centric and multi-generational marketing” using the new media tools available.